These were run from 2006 to 2009, at which point we replaced them with our Accreditation initiative. Here is an account of their purpose together with links to the winners for those years. The awards are open to all schools, colleges, youth clubs faith groups or other centres of learning who are using Peace Mala to educate their youngsters. The purpose of the awards is to encourage youngsters to explore the objectives of Peace Mala and become aware of and involved with issues of peace, justice, tolerance and friendship. It will challenge youngsters to produce a project that fits in with the objectives of Peace Mala. We will be looking for Your Peace Mala Story. Tell us what impact you feel Peace Mala has had on the life of your school, college or youth group. Let us know what Peace Mala has inspired your young people to say and do. Students will be encouraged to present their project by using any or all of the following combinations: literature, art, music, dance, drama, ICT, media and photography. Peace Mala is happy to visit local schools or youth groups to give presentations and workshops on the Peace Mala project. Please contact our registered office if you would like us to visit you. Your Peace Mala Story must be used in conjunction with the principles of Peace Mala. Any school, college, youth club, faith group or other centre of learning currently using Peace Mala to educate is entitled to send us their story. There will be two awards: Junior (5-11) and Senior (12-18). All entries must be sent to the Peace Mala Registered Office. 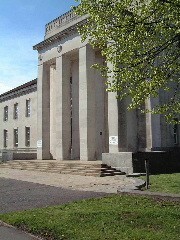 The Award Ceremony will take place in the early autumn at the Temple of Peace in Cardiff, Wales, UK. If you intend entering the Peace Mala Awards for Youth competition and need advice or help with your project, please send us an e-mail or telephone us on 01792 774225. We'd like to keep a check on interest levels. We are also here to help you with any queries regarding the competition. We look forward to hearing from you. 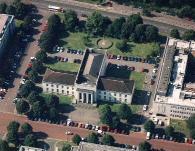 Peace Mala was launched in this beautiful building, the UNA Wales Temple of Peace in Cardiff, on Wednesday 27th November 2002 with The Most Reverend Dr. Rowan Williams, Archbishop of Canterbury, and representatives of fourteen spiritual paths. This was possible thanks to the kind permission of the Welsh Centre for International Affairs. Once again the WCIA have been generous in their support of the Peace Mala and have granted us use of this wonderful building for the awards. Doctor Who fans will be aware that this wonderful building was the setting for Doctor Who: The End of the World. The Temple of Peace became a huge reception chamber for aliens from across the galaxy to watch the end of the Earth. It is important for young people to learn that the diversity of the human race should be celebrated and not feared. Making and wearing the Peace Mala will give youngsters an opportunity to take part in this wonderful project for world peace. It will also introduce young people to our plural community of diverse cultures and faiths. Young people can learn that communities filled with colour and difference, make life more interesting and exciting. We hope that the Peace Mala will stimulate interest and encourage youngsters, and adults, to find out more about the faiths and spiritual paths represented on it. We hope that teachers and leaders of faith communities will join in this initiative and help spread the message of love, respect and peace through places of worship, Youth clubs, schools, colleges and other centres of learning. Education for global citizenship through the promotion of understanding, respect, friendship, tolerance and peace between all communities, cultures and enlightened, compassionate faiths. Peace Mala supports human rights, confronts bullying and all forms of prejudice. Peace Mala raises awareness of issues of global interdependence and encourages active compassion by learners that will effect positive changes locally and globally. 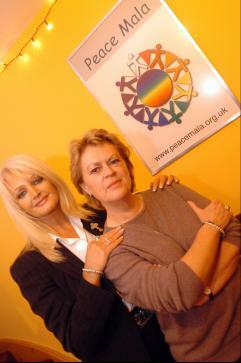 This photo is of Bonnie Tyler and Pam Evans was taken at the launch ( by Robert Meleen and used here with kind permission of the editor of the South Wales Evening Post). Both the Bespoke Peace Mala and Awards for Youth were both launched by the international rock singer, Bonnie Tyler, on Tuesday 8th November at Peace Mala H.Q. in Swansea, Wales, UK. It is our intention that money generated from the sale of Bespoke Peace Malas will be put into the Peace Mala Awards for Youth.